It is certainly an exciting job – and what a view! But I’m amazed at all the fiddly stuff on the outside of the ISS. I wouldn’t have the confidence – too scared of being caught up in all the wires and gadgets. Although, there would not be a problem with dropping tools and gadgets. See how Gennady Padalka, or is it Mikhail Korniyenko, disposes of the replaced item at the end! This video has been making the rounds lately. It is a view of the sun, the camera moving back at the speed of light – illustrating in realtime, the journey of a photon of light emitted from the surface of the sun and traveling across a portion of the solar system – from a human perspective. The animation ends at Jupiter Even so, it certainly illustrated to me that interplanetary travel is going to get extremely boring without lots of things to occupy the travellers. They won’t be travelling this fast. Phil Plait gave another perspective of distances in space in his article Can You Really Fit All the Planets Between the Earth and Moon? He answers the question with a Yes – sometimes! At most times the planets just do not fit. At apogee, when the Moon is farthest from the Earth, the center-to-center distance is more like 406,000 km, so about 398,000 km surface-to-surface. Aha! At lunar apogee, the planets do fit, rather comfortably. And there’s more: I used the average diameters of the planets. Most of the planets are not spherical, but due to their rotation they’re oblate, or squashed; smaller in diameter through their poles than across their equators. We can make them fit better if we align them through their polar axes. That total distance is 364,799 km. That’s still too much if the Moon is at perigee, but gives us a little more breathing room when the Moon’s at apogee. Finally, we can look at the average distance of the Earth to the Moon, which is 384,400 km, or 376,000 km surface-to-surface. 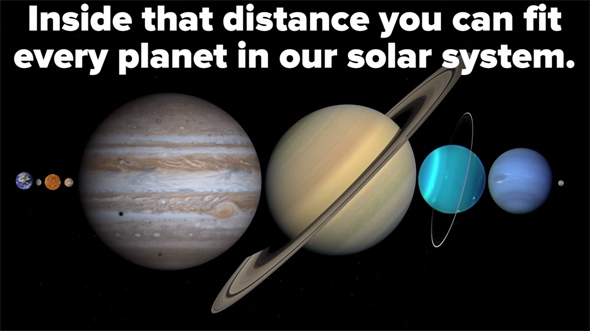 In that case the planets fit if we align them pole to pole, but not using their average diameters. If you haven’t watch it yet this video, Wanderers, is a must. And it is well worth watching full screen. It’s a science-inspired short film imagining human exploration of our solar system. The voice-over is very recognisable – Carl Sagan reading from Pale Blue Dot. “This is one of the most wondrous and moving paeans to space exploration I have ever seen. The words of Sagan are magnificent, of course. And the effects are stunning, photo-realistic, and very compelling. But take a moment and let this sink in: Nearly every location depicted in this video is real. These aren’t just fanciful places made up in the head of a special-effects artist; those are worlds in our solar system that actually exist. And many were based on images taken through telescopes, or probes that have physically visited these distant locales. Sunset on Mars. The weird ridge wrapped around Saturn’s moon Iapetus. The ice fields of Jupiter’s moon Europa. Even those cliff divers? Yup: That’s Uranus’ moon Miranda, with the highest cliffs known in the solar system. All this is fantasy today but realistically possible in the not too distant future. Thanks to: This Is A Majestic Vision Of Humans Embracing Our Exotic Solar System. Unusual photo of Moon and Earth. Here’s a photo of the earth you don’t often see. Nor is the view of the moon familiar. The Chinese test vehicle Change’5 took this photo as it swung around the moon before returning to earth. So we see the unfamiliar far side of the moon, with the earth in the distance. 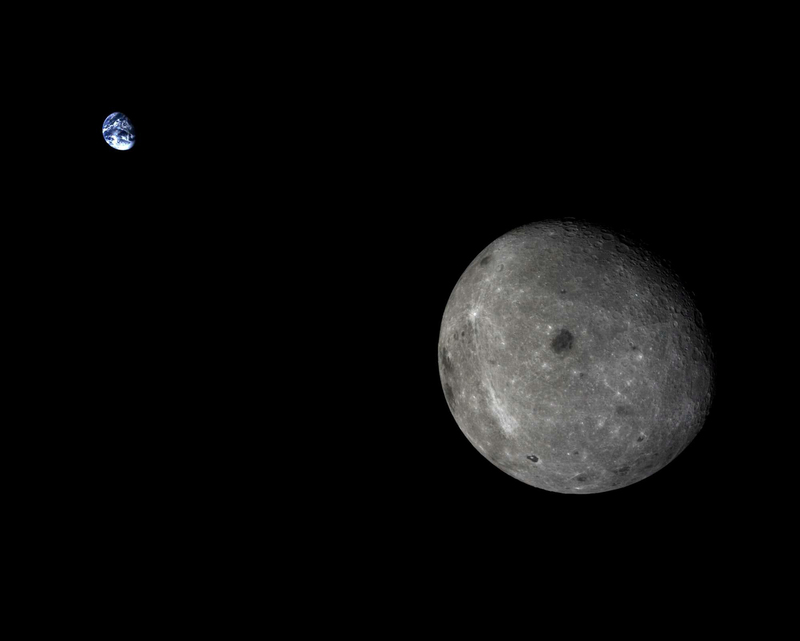 Emily Lakdawalla displays this and some other photos taken by Change’5 in a recent blog article Chang’e 5 T1 rounds the lunar farside, returns lovely photo of Earth and the Moon together. 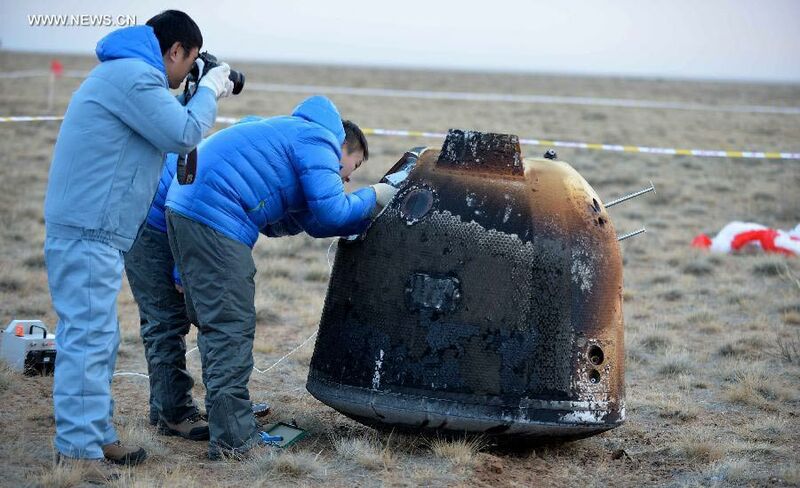 After an 8-day mission Change-5 landed safely in Siziwang Banner of China’s Inner Mongolia Autonomous Region. China is only the third nation to demonstrate lunar return technology following the former Soviet Union and the United States. The Soviet Union conducted the last lunar return mission in the 1970s. Photo Credit: Curiosity on Mars – NASA Rover Opportunity Views Comet Near Mars. NASA’s Mars Exploration Rover Opportunity captured images of a comet passing much closer to Mars than any previous known comet flyby of Earth or Mars. 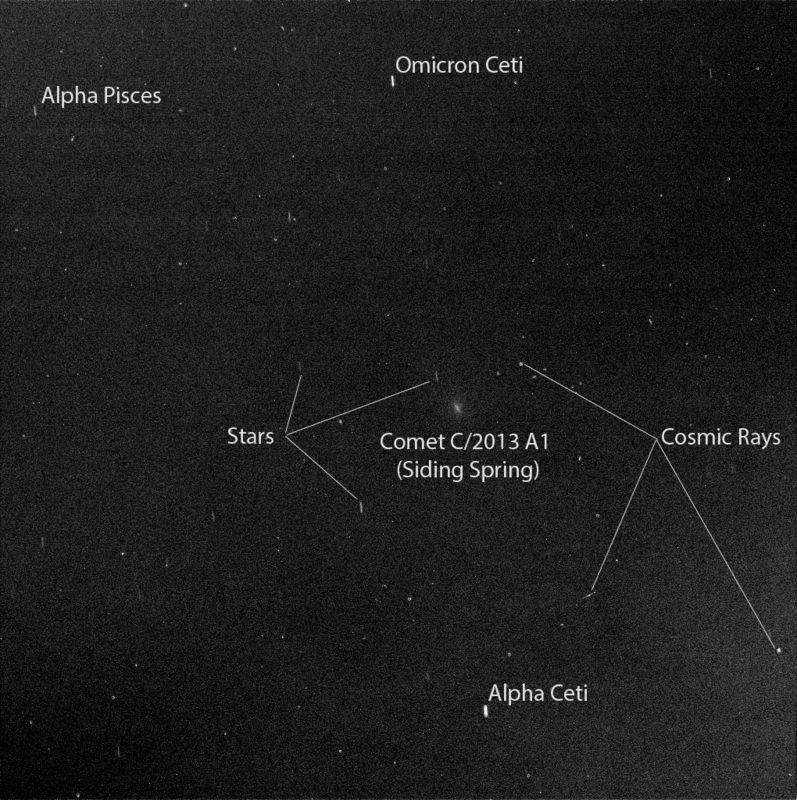 The images of comet Siding Spring were taken against a backdrop of the pre-dawn Martian sky on Sunday (Oct. 19). Researchers used Opportunity’s Pancam to image at a range of exposure times about two-and-one-half hours before the closest approach of the nucleus of comet Siding Spring to Mars. By the time of closest approach at about 87,000 miles (139,500 kilometers), dawn had lit the sky above Opportunity. This morning I watched the launch of the Sentinel 1A satellite. The launch was perfect and the coverage on Spaceflight Now excellent with plenty of explanation along the way. The satellite was launched aboard a Russian Soyuz rocket from the European Space Agency (ESA) launch pad Kourou near the town of Sinnamary, French Guiana, on South America’s northern Atlantic coastline. Sentinel 1A was built by Thales Alenia Space of France and Italy. The satellite is now being managed from a mission control centre in Darmstadt, Germany. Viewing this event I couldn’t help noticing the programme is a result of cooperation between several countries. First of all, countries in the European Commission and ESA, but also Russia which provided the launcher and whose companies were involved in the launch. That cooperation is obvious from the fact that English, French, German, Italian and Russian languages were being used. International cooperation is vital to the success of these scientifically important projects. They are just too big and complex to be handled by single nations. Scientific success is not an end in itself – is the basis for humanitarian success. international cooperation is vital for solving environmental, economic and security problems all countries face today. Given Russia’s ongoing violation of Ukraine’s sovereignty and territorial integrity, NASA is suspending the majority of its ongoing engagements with the Russian Federation. NASA and Roscosmos will, however, continue to work together to maintain safe and continuous operation of the International Space Station. NASA is laser focused on a plan to return human spaceflight launches to American soil, and end our reliance on Russia to get into space. This has been a top priority of the Obama Administration’s for the past five years, and had our plan been fully funded, we would have returned American human spaceflight launches – and the jobs they support – back to the United States next year. With the reduced level of funding approved by Congress, we’re now looking at launching from U.S. soil in 2017. The choice here is between fully funding the plan to bring space launches back to America or continuing to send millions of dollars to the Russians. It’s that simple. The Obama Administration chooses to invest in America – and we are hopeful that Congress will do the same. Any long-term operation of these sanctions, despite the exclusion of the International Space Station work, will inevitable have a negative effect on international scientific cooperation. And will inevitably retard humanity’s work on alleviating our environmental, economic and security problems. Frankly I think these sanction are cynical measures resulting from inevitable geopolitical frictions and should only have a relatively short lifetime. Have a look at this infographic for a summary of the Copernicus programme and the satellites involved. “Copernicus provides a unified system through which vast amounts of data, acquired from space and from a multitude of in situ sensors, are fed into a range of thematic information services designed to benefit the environment, the way we live, humanitarian needs and support effective policy-making for a more sustainable future. These services fall into six main categories: land management, the marine environment, atmosphere, emergency response, security and climate change. See also: European Earth observing craft prepared for launch. Karl Battams reports (The Mercury Transit You Probably Missed) there was a transit of the sun by Mercury recently. Despite this being a rare event nothing was made of it – because it wasn’t visible from earth! Here is a video of the transit taken by the NASA STEREO-A satellite At the moment this is on the opposite side of the Sun from Earth. Fascinating that we have enough presence in the solar system now to make such a record. Well, this is pretty historic! China has successfully soft landed its probe on the moon and the rover is now on the surface. The Planetary society’s Emily Lakdawalla has posted TV video of the unloading of the Rover – see Six wheels on soil for Yutu! For those wanting to follow the process in real-time this is the video from the TV coverage. I find this fascinating – a short video of an eclipse of the sun by the largest Martian moon, Phobos. Photographed by Curiosity a rover/laboratory landed on Mars just over a year ago. This week we mark the first anniversary of the landing of the Mars Science Laboratory, Curiosity, in the Gale Crater on Mars. TV and video coverage of this landing had a huge international audience on the night. It was certainly one of the top scientific events of the year. The video below gives a short review of Curiosity and its landing. Curiosity team members at NASA’s Jet Propulsion Laboratory (JPL) in Pasadena, Calif., will share remembrances about the dramatic landing night and the mission overall in an event that will air on NASA Television and the agency’s website from 10:45 a.m. to noon EDT on Tuesday, Aug. 6 (2:45 to 4 a.m. Wednesday Aug. 7 NZST). Immediately following that program NASA TV will carry a live public event from NASA Headquarters in Washington. That event will feature NASA officials and crew members aboard the International Space Station as they observe the rover anniversary and discuss how its activities and other robotic projects are helping prepare for a human mission to Mars and an asteroid. Social media followers may submit questions on Twitter and Google+ in advance and during the event using the hashtag #askNASA. 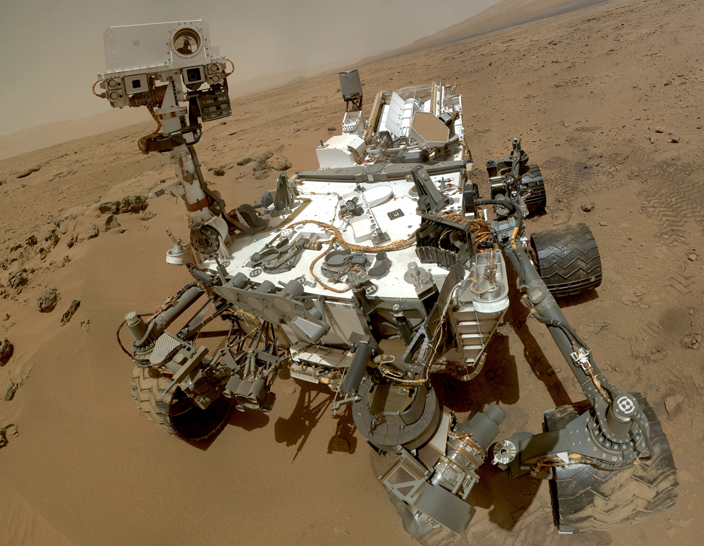 And here’s a few links with further information on Curiosity, its discoveries and celebration of the anniversary back here on earth.